1500 Tradesman, Tradesman, If your looking for quality customer service and a friendly atmosphere, come on down to Sunset Chrysler and let us show you how much we value and appreciate the opportunity for your potential business. 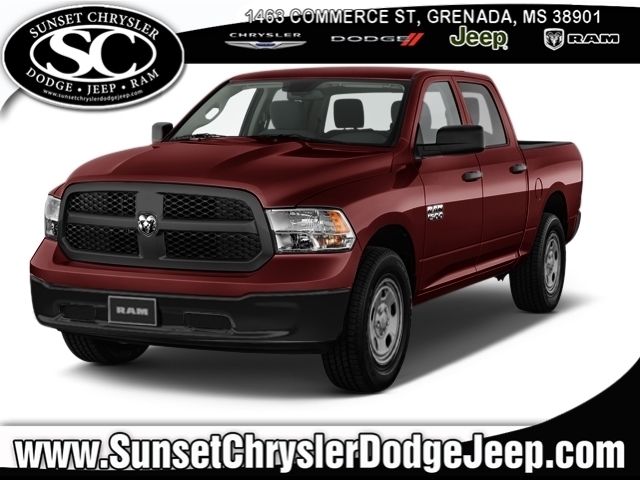 The sales staff here at Sunset is dedicated to making customer satisfaction the NUMBER ONE priority!, 40/20/40 Split Bench Seat,5.0' Touchscreen Display,50 State Emissions,Active Grille Shutters,Anti-Spin Differential Rear Axle,Black Rotary Shifter,Body Color Front Fascia,Body Color Grille,Body Color Rear Bumper w/Step Pads,Carpet Floor Covering,Center Hub,Charge Only Remote USB Port,Cloth 40/20/40 Bench Seat,Delete Class IV Receiver Hitch,Delete Spray In Bedliner,Dual Rear Exhaust w/Bright Tips,Electronic Shift,Electronically Controlled Throttle,Engine Oil Heat Exchanger,Engine: 5.7L V8 HEMI MDS VVT,Express Value Package,Fog Lamps,Front and Rear Floor Mats,Front Armrest w/3 Cupholders,Full Size Temporary Use Spare Tire,GPS Antenna Input,GVWR: 6,900 lbs,Heavy Duty Engine Cooling,Heavy Duty Transmission Oil Cooler,Hemi Badge,Integrated Voice Command w/Bluetooth,Locking Lug Nuts,Media Hub,Next Generation Engine Controller,Overhead Console,ParkView Rear Back-Up Camera,Quick Order Package 26J Express,Radio: Uconnect 5.0,Ram 1500 Express,Rear Folding Seat,Rear View Auto Dim Mirror w/Display,Remote Keyless Entry w/All-Secure,SIRIUSXM Satellite Radio,Storage Tray,Temperature and Compass Gauge,Tip Start,Tires: P275/60R20 OWL AS,Transmission: 8-Speed Automatic,Wheels: 17' x 7' Aluminum,Wheels: 20' x 9' Aluminum Chrome Clad If your looking for quality customer service and a friendly atmosphere, come on down to Sunset Chrysler and let us show you how much we value and appreciate the opportunity for your potential business. The sales staff here at Sunset is dedicated to making customer satisfaction the NUMBER ONE priority! 1500 Tradesman, Tradesman, You won't want to miss this excellent value! Take control of this high-value modern machine! All of the following features are included: a front bench seat, a trailer hitch, and much more. It features an automatic transmission, rear-wheel drive, and a refined 6 cylinder engine. Our sales staff will help you find the vehicle that you've been searching for. We'd be happy to answer any questions that you may have. Stop in and take a test drive! Price does not include any government fees and taxes, any finance charges, vehicle emissions testing charges and dealer documentation preparation fees Not all buyers will qualify. Must receive financing through Chrysler Capital for Chrysler Capital Bonus Cash. For Upfit Incentive, customer must be a business owner and vehicle must be used for business purposes. For Lease Loyalty Rebate, customer must be leasing (for a minimum of 30 days) a Chrysler Group vehicle. Not all customers will qualify. See dealer for complete details. Subject to prior sale. Offer ends 01/03/2016., Quick Order Package 22B Tradesman,Engine: 3.6L V6 24V VVT,Tradesman Package,50 State Emissions,Heavy Duty Vinyl 40/20/40 Split Bench Seat,Transmission: 8-Speed Automatic You won't want to miss this excellent value! Take control of this high-value modern machine! All of the following features are included: a front bench seat, a trailer hitch, and much more. It features an automatic transmission, rear-wheel drive, and a refined 6 cylinder engine. Our sales staff will help you find the vehicle that you've been searching for. We'd be happy to answer any questions that you may have. Stop in and take a test drive! Price does not include any government fees and taxes, any finance charges, vehicle emissions testing charges and dealer documentation preparation fees Not all buyers will qualify. Must receive financing through Chrysler Capital for Chrysler Capital Bonus Cash. For Upfit Incentive, customer must be a business owner and vehicle must be used for business purposes. For Lease Loyalty Rebate, customer must be leasing (for a minimum of 30 days) a Chrysler Group vehicle. Not all customers will qualify. See dealer for complete details. Subject to prior sale. Offer ends 01/03/2016. 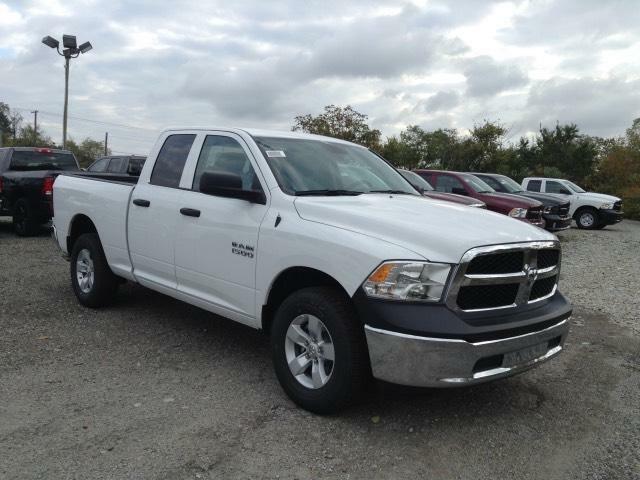 1500 Tradesman/Express, Tradesman/Express, This Ram won't be on the lot long! There is no mistaking this truck for anything but extraordinary. All of the following features are included: power windows, a bedliner, and much more. It features four-wheel drive capabilities, a durable automatic transmission, and a powerful 8 cylinder engine. You will have a pleasant shopping experience that is fun, informative, and never high pressured. 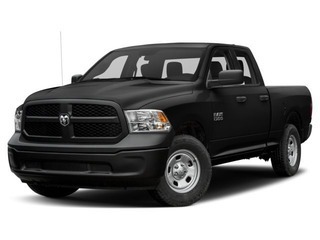 Please don't hesitate to give us a call., Black Ram Head Tailgate Badge,Cloth 40/20/40 Bench Seat,Popular Equipment Group,Integrated Voice Command w/Bluetooth,GPS Antenna Input,Media Hub,Remote Keyless Entry w/All-Secure,Add Class IV Receiver Hitch,Body Color Rear Bumper w/Step Pads,Semi-Gloss Black Hub,Body Color Front Fascia,5.0' Touchscreen Display,Front and Rear Floor Mats,Next Generation Engine Controller,Delete Class IV Receiver Hitch,Wheels: 17' x 7' Aluminum,Charge Only Remote USB Port,SIRIUSXM Satellite Radio,Black Headlamp Bezels,Engine: 5.7L V8 HEMI MDS VVT,Flat Black 5.7L Hemi Badge,Overhead Console,Dual Rear Exhaust w/Bright Tips,Black Ram 1500 Express Group,Wheels: 20' x 8' Semi-Gloss Black Aluminum,Heavy Duty Engine Cooling,Center Hub,Flat Black Ram 1500 Badge,Hemi Badge,Active Grille Shutters,Black Painted Honeycomb Grille,Tip Start,Ram 1500 Express,GVWR: 6,900 lbs,Engine Oil Heat Exchanger,4x4 Flat Black Badge,Electronically Controlled Throttle,Delete Hemi Badge,Radio: Uconnect 5.0,Rear Folding Seat,Carpet Floor Covering,Rotary Shifter-Black,32 Gallon Fuel Tank,40/20/40 Split Bench Seat,Transmission: 8-Speed Automatic,Full Size Temporary Use Spare Tire,Body Color Grille,Delete Spray In Bedliner,Quick Order Package 27J Express,Temperature and Compass Gauge,Add Spray In Bedliner,Tires: P275/60R20 BSW AS,Electronic Shift,Heavy Duty Transmission Oil Cooler,Fog Lamps,50 State Emissions,Front Armrest w/3 Cupholders This Ram won't be on the lot long! There is no mistaking this truck for anything but extraordinary. All of the following features are included: power windows, a bedliner, and much more. It features four-wheel drive capabilities, a durable automatic transmission, and a powerful 8 cylinder engine. You will have a pleasant shopping experience that is fun, informative, and never high pressured. Please don't hesitate to give us a call. 1500 Tradesman, Tradesman, This vehicle won't be on the lot long! Both practical and stylish! This model accommodates 6 passengers comfortably, and provides features such as: an automatic dimming rear-view mirror, a trailer hitch, and much more. Smooth gearshifts are achieved thanks to the refined 6 cylinder engine, and for added security, dynamic Stability Control supplements the drivetrain. Four wheel drive allows you to go places you've only imagined. You will have a pleasant shopping experience that is fun, informative, and never high pressured. 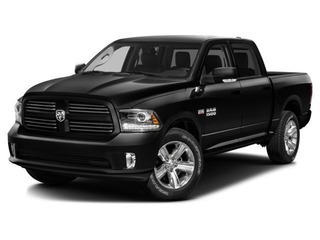 Please don't hesitate to give us a call., Black Ram Head Tailgate Badge,Engine: 3.6L V6 24V VVT,Cloth 40/20/40 Bench Seat,LED Bed Lighting,4x4 Flat Black Badge,Popular Equipment Group,Radio: Uconnect 5.0,Integrated Voice Command w/Bluetooth,Delete Hemi Badge,Rear Folding Seat,GPS Antenna Input,Remote Keyless Entry w/All-Secure,Media Hub,Body Color Rear Bumper w/Step Pads,Semi-Gloss Black Hub,Body Color Front Fascia,Carpet Floor Covering,5.0' Touchscreen Display,Front and Rear Floor Mats,Storage Tray,Delete Class IV Receiver Hitch,Wheels: 17' x 7' Aluminum,Charge Only Remote USB Port,SIRIUSXM Satellite Radio,Black Headlamp Bezels,40/20/40 Split Bench Seat,Flat Black 5.7L Hemi Badge,Transmission: 8-Speed Automatic,Overhead Console,Full Size Temporary Use Spare Tire,Black Ram 1500 Express Group,Wheels: 20' x 8' Semi-Gloss Black Aluminum,Body Color Grille,Delete Spray In Bedliner,Temperature and Compass Gauge,Add Spray In Bedliner,ParkView Rear Back-Up Camera,Center Hub,Tires: P275/60R20 BSW AS,Flat Black Ram 1500 Badge,Quick Order Package 22J Express,Black Painted Honeycomb Grille,Fog Lamps,50 State Emissions,Rear View Auto Dim Mirror w/Display,Front Armrest w/3 Cupholders,Ram 1500 Express This vehicle won't be on the lot long! Both practical and stylish! This model accommodates 6 passengers comfortably, and provides features such as: an automatic dimming rear-view mirror, a trailer hitch, and much more. Smooth gearshifts are achieved thanks to the refined 6 cylinder engine, and for added security, dynamic Stability Control supplements the drivetrain. Four wheel drive allows you to go places you've only imagined. You will have a pleasant shopping experience that is fun, informative, and never high pressured. Please don't hesitate to give us a call. 1500 Tradesman, Tradesman, Only 14,589 Miles! Delivers 23 Highway MPG and 16 City MPG! 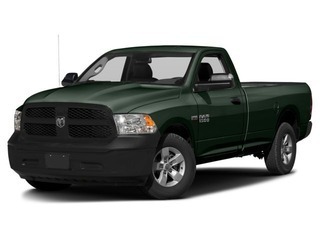 This Ram 1500 boasts a Regular Unleaded V-6 3.6 L/220 engine powering this Automatic transmission. Wheels: 17' x 7' Steel, Variable Intermittent Wipers, Urethane Gear Shift Knob. 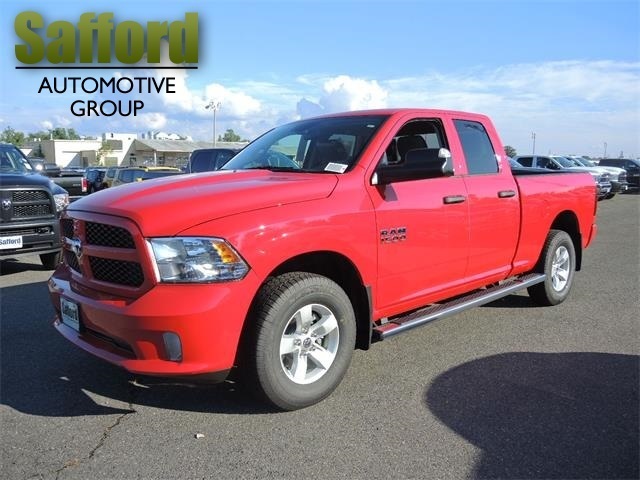 This Ram 1500 Comes Equipped with These Options Transmission: 8-Speed Automatic (845RE), Transmission w/Driver Selectable Mode, Sequential Shift Control w/Steering Wheel Controls and Oil Cooler, Tires: P265/70R17 BSW AS, Tire Specific Low Tire Pressure Warning, Tip Start, Tailgate Rear Cargo Access, Systems Monitor, Steel Spare Wheel, Spray-In Bed Liner, Single Stainless Steel Exhaust. 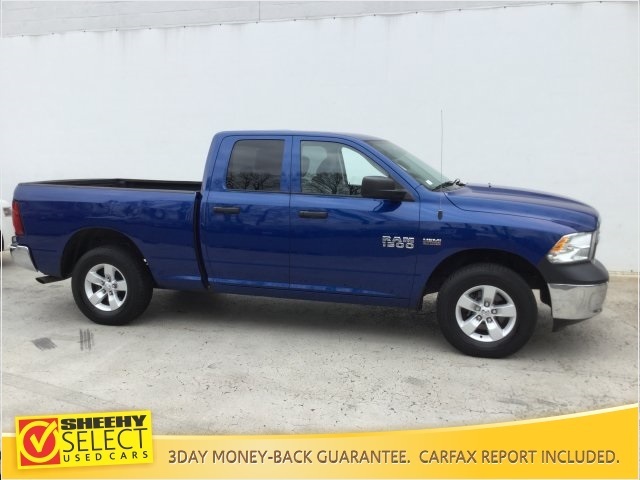 Visit Us Today Stop by Bleecker Chrysler Dodge Jeep located at 1110 E Cumberland St, Dunn, NC 28334 for a quick visit and a hassle-free deal!, 3.6L V6 Engine Only 14,589 Miles! Delivers 23 Highway MPG and 16 City MPG! This Ram 1500 boasts a Regular Unleaded V-6 3.6 L/220 engine powering this Automatic transmission. Wheels: 17' x 7' Steel, Variable Intermittent Wipers, Urethane Gear Shift Knob. 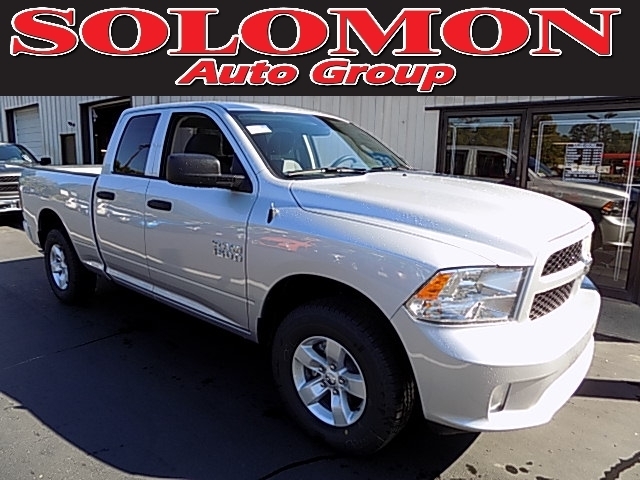 This Ram 1500 Comes Equipped with These Options Transmission: 8-Speed Automatic (845RE), Transmission w/Driver Selectable Mode, Sequential Shift Control w/Steering Wheel Controls and Oil Cooler, Tires: P265/70R17 BSW AS, Tire Specific Low Tire Pressure Warning, Tip Start, Tailgate Rear Cargo Access, Systems Monitor, Steel Spare Wheel, Spray-In Bed Liner, Single Stainless Steel Exhaust. 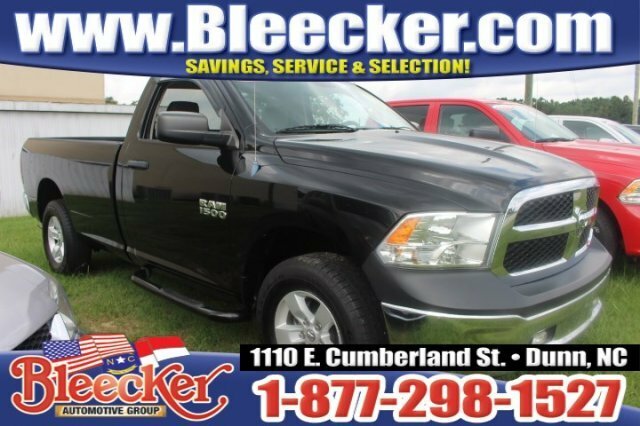 Visit Us Today Stop by Bleecker Chrysler Dodge Jeep located at 1110 E Cumberland St, Dunn, NC 28334 for a quick visit and a hassle-free deal! BRIGHTSILVER METALLIC CLEAR COAT EXTERIOR PAINT, BLACK / DIESEL GRAYINTERIOR COLORS, 3.6-LITER V6 24-VALVE VVT ENGINE, 8-SPEED AUTOMATIC845RE TRANSMISSION, EXPRESS PACKAGE 22J, POPULAR EQUIPMENT GROUP,SIRIUSXM SAT RADIO W/ 1-YR RADIO SUBSCRIPTION, PARKVIEW REARBACK-UP CAMERA, AND SO MUCH MORE Comein and test drive your new Ram 1500 Express Quad Cab 4x4 today! MSRP:$38,350 WETAKE ANYTHING ON TRADE! SPECIAL INTEREST RATES/TERMS AVAILABLE! NOCREDIT? NO PROBLEM! WECAN HELP GET YOU FINANCED! E-MAIL OR CALL 724-785-8000 SOLOMON CJD OFBROWNSVILLE, PA. *Priceincludes most rebates and incentives. You may qualify for additionalincentives. Examples include college graduate, military, specialevent offers and supplier discount offers. Go to solomonauto.com forpricing.Call 855-384-3034 and ask for Mike Nath in the Commercial Sales Department. 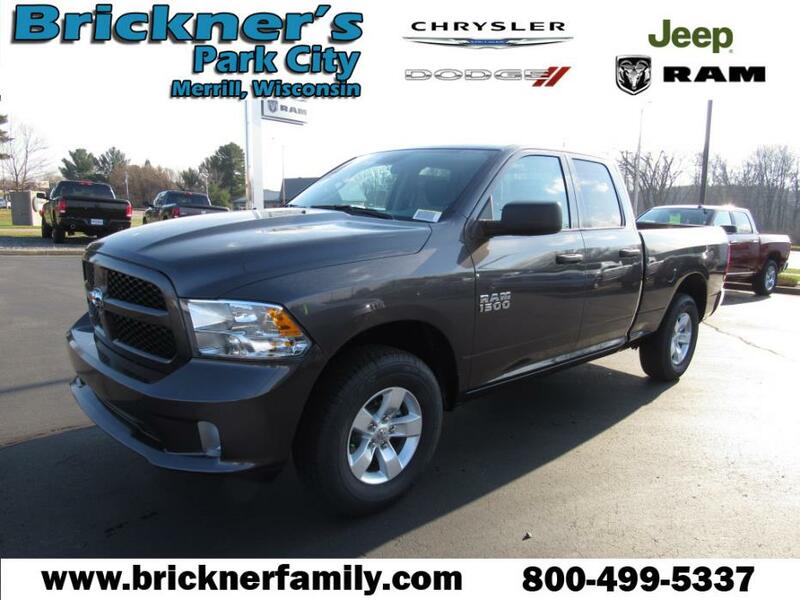 1500 Tradesman, Tradesman, Look forward to long road trips with anti-lock brakes, traction control, and emergency brake assistance in this 2016 RAM 1500 Tradesman. It comes with a 5.7 liter 8 Cylinder engine. Looking to buy a safer regular cab 4x4? Look no further! This one passed the crash test with 4 out of 5 stars. It has a bright white clearcoat exterior and a black / diesel gray interior. According to a review from New Car Test Drive, The Ram compares very well to the competition and is the most distinctive among a group of distinctive trucks. Interested? Don't let this regular cab 4x4 slip away! Call today for a test drive. 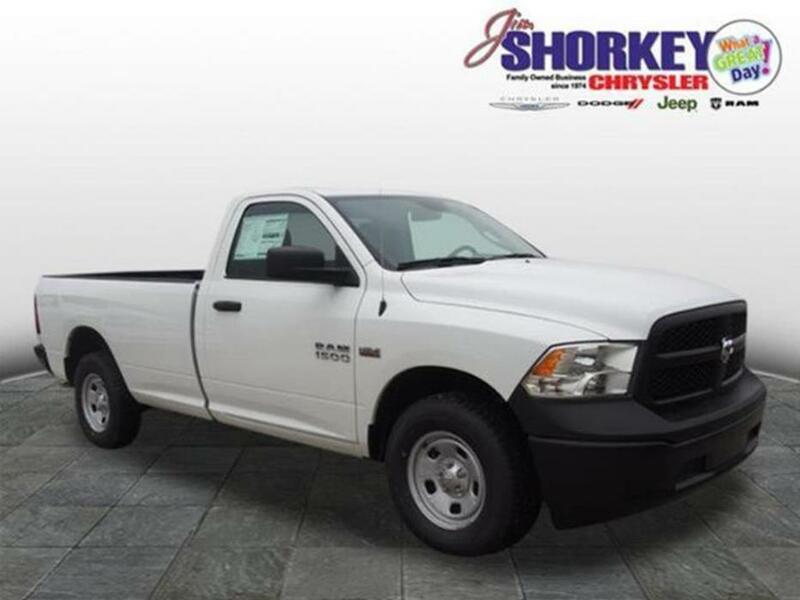 Jim Shorkey Chrysler Dodge Jeep Ram 13230 Route 30 North Huntington, PA 15642 (888) 253-1789., Tradesman Package,Heavy Duty Engine Cooling,Electronically Controlled Throttle,Black Rotary Shifter,Electronic Shift,Anti-Spin Differential Rear Axle,Hemi Badge,Heavy Duty Transmission Oil Cooler,Active Grille Shutters,Next Generation Engine Controller,Quick Order Package 26B Tradesman,Tip Start,50 State Emissions,Engine: 5.7L V8 HEMI MDS VVT,Heavy Duty Vinyl 40/20/40 Split Bench Seat,Transmission: 8-Speed Automatic Look forward to long road trips with anti-lock brakes, traction control, and emergency brake assistance in this 2016 RAM 1500 Tradesman. It comes with a 5.7 liter 8 Cylinder engine. Looking to buy a safer regular cab 4x4? Look no further! This one passed the crash test with 4 out of 5 stars. It has a bright white clearcoat exterior and a black / diesel gray interior. 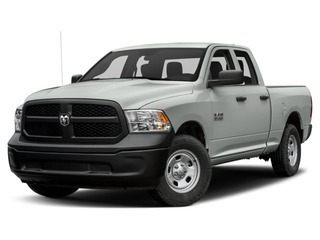 According to a review from New Car Test Drive, The Ram compares very well to the competition and is the most distinctive among a group of distinctive trucks. Interested? Don't let this regular cab 4x4 slip away! Call today for a test drive. Jim Shorkey Chrysler Dodge Jeep Ram 13230 Route 30 North Huntington, PA 15642 (888) 253-1789. 1500 Tradesman/Express, Tradesman/Express, Hurry and take advantage now! This Ram won't be on the lot long! This is a superior vehicle at an affordable price! This model accommodates 6 passengers comfortably, and provides features such as: variably intermittent wipers, a bedliner, and 1-touch window functionality. It features an automatic transmission, 4-wheel drive, and a refined 6 cylinder engine. We pride ourselves in consistently exceeding our customer's expectations. 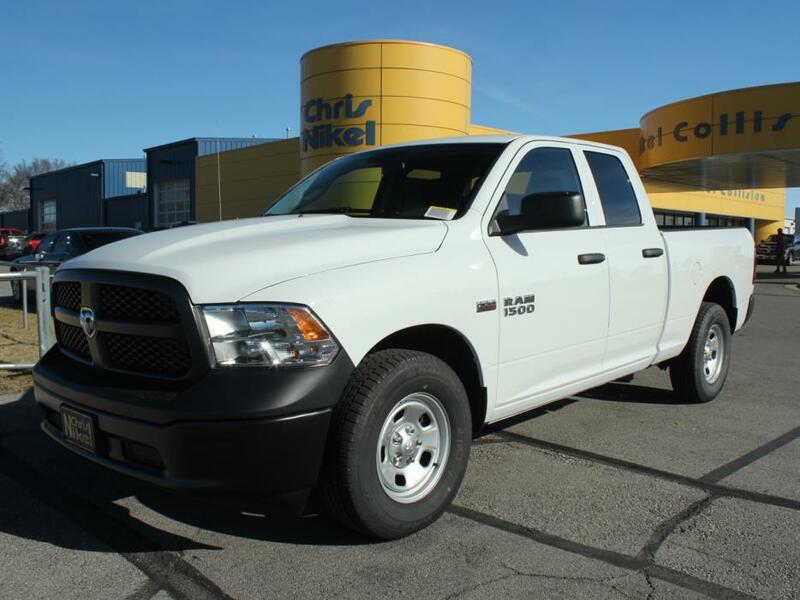 Stop by our dealership or give us a call for more information., Engine: 3.6L V6 24V VVT,Cloth 40/20/40 Bench Seat,Exterior Mirrors Courtesy Lamps,Popular Equipment Group,Integrated Voice Command w/Bluetooth,Rear Folding Seat,Trailer Tow Mirrors,Remote USB Port,Media Hub,No Satellite Coverage w/AK/HI/PR/VI,Remote Keyless Entry w/All-Secure,Add Class IV Receiver Hitch,Trailer Tow Mirrors and Brake Group,Body Color Rear Bumper w/Step Pads,Body Color Front Fascia,Carpet Floor Covering,Front and Rear Floor Mats,Wheel to Wheel Side Steps,Delete Class IV Receiver Hitch,Wheels: 17' x 7' Aluminum,32 Gallon Fuel Tank,SIRIUSXM Satellite Radio,Exterior Mirrors w/Heating Element,40/20/40 Split Bench Seat,Trailer Brake Control,Transmission: 8-Speed Automatic,For More Info, Call 800-643-2112,Black Exterior Mirrors,Body Color Grille,Exterior Mirrors w/Supplemental Signals,Delete Spray In Bedliner,Add Spray In Bedliner,Radio: Uconnect 3.0,Center Hub,ParkView Rear Back-Up Camera,1-Year SIRIUSXM Radio Service,Quick Order Package 22J Express,Fog Lamps,Audio Jack Input for Mobile Devices,50 State Emissions,Front Armrest w/3 Cupholders,Rear View Auto Dim Mirror w/Display,Power Black Trailer Tow Mirrors,Ram 1500 Express Hurry and take advantage now! This Ram won't be on the lot long! This is a superior vehicle at an affordable price! This model accommodates 6 passengers comfortably, and provides features such as: variably intermittent wipers, a bedliner, and 1-touch window functionality. It features an automatic transmission, 4-wheel drive, and a refined 6 cylinder engine. We pride ourselves in consistently exceeding our customer's expectations. Stop by our dealership or give us a call for more information.